Impress your customers with high quality bathroom drainage solutions. For developers and architects thinking in the long term, the ACO Shower Drain is a decision for prudent luxury where all the details can be relied on. The extremely smooth passivated surfaces guarantee safe drainage and hygiene in bathrooms. The seals, joints and thickness of the materials are guarantees for low noise emissions. The ACO ShowerDrain E shower channel is equal to any technical or aesthetic challenges which exist for high-quality floor-level shower solutions. Thanks to its low install height the shower channel is equally suitable for new constructions and renovations. The high performance drainage also guarantees sufficient water drainage for even powerful shower fittings. Optical design options are virtually limitless with the ACO ShowerDrain E. The shower channel is sold in three basic forms and can be combined with various designer gratings made from stainless steel or glass covers or with a cover which can be tiled. A fire protection solution is also available. For all stainless steel shower channels you can also have LED lighting built in. This creates a very special atmosphere in the bathroom and can be supplied in a number of different colours. The shower drain solution from ACO for objects called ACO ShowerDrain C. For large projects, such as hospitals, hotels or residences, this product solution is character­ised by modern design and perfect func­tionalality. The basic is the high quality stainless steel which is used for the pro­duction of the shower channel itself, gully and grating. The foul air trap is made out of polypro­pylene. The steel parts are passivated; the gratings are brushed to the silk gloss. 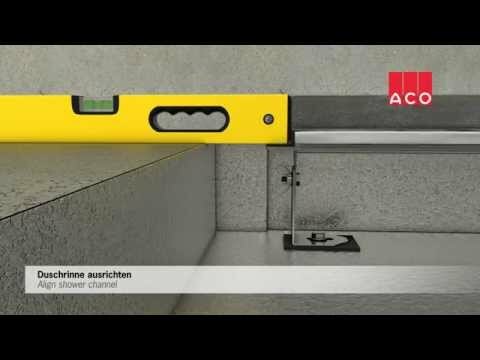 From the user´s point of view the ACO ShowerDrain C excelled especially by the high flow rate, very low construction height and very easy maintenance.